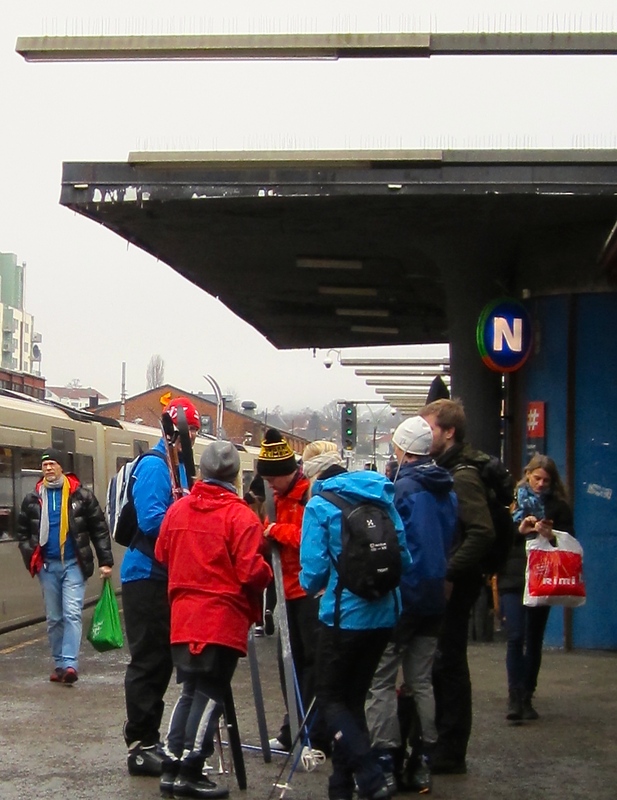 A group of teenagers prepare to board the train to Sognsvann, where ski school awaits. I do understand their ardor. It’s terrific exercise — cross-country skiers have the highest cardiovascular fitness levels of all sports, as any Scandinavian will tell you. Plus, it’s a great way to enjoy the scenic countryside and avoid cabin fever. Nothing like zipping along through the snow-laden forests, so quietly that you can sneak up on animals and birds as they forage for supper. Beats the heck out of loud, smelly, bone-jarring snowmobiling by far. 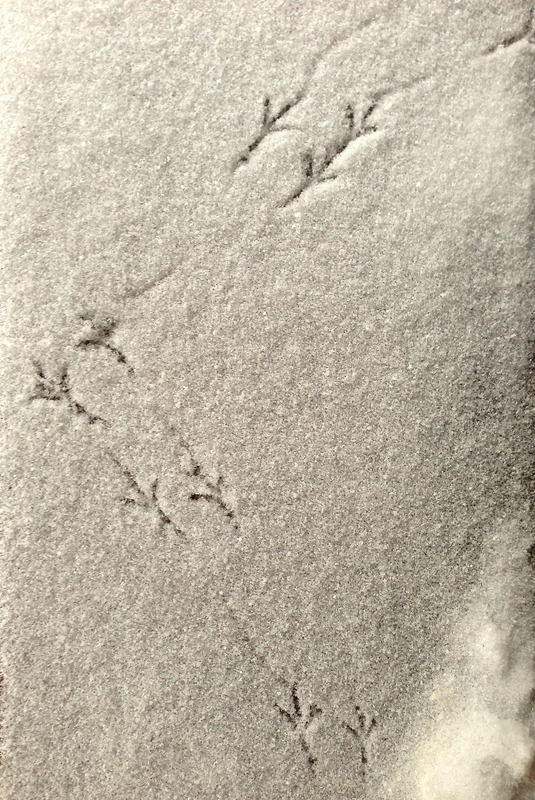 Birdie tracks in the snow. Matthew and I have long been devotees of the sport, having both taken lessons in college. Most winters we manage to squeeze in several trips along Chicago’s lakefront, through Lincoln Park, and sometimes even out to the more remote Waterfall Glen. 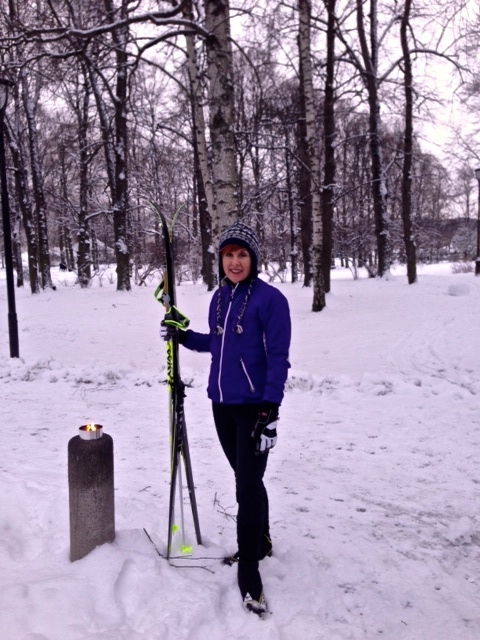 But our experience in the flatlands of the Midwest in no way prepared us for our first attempt at cross-country skiing in Norway, Europe’s third most mountainous country. Our Norwegian colleagues roasted us for even considering tackling the hills here with our waxless skis that we’d bought at a rental store 20 years ago, so we left our antiques at home. All togged out in my fancy new ski attire and equipment. After dutifully waiting an hour for our number to be called, our patience was rewarded with the news that the store didn’t carry skis or poles for my diminutive stature. (Five-foot-tall adults are rare in a Nordic population, and apparently kids’ skis aren’t stiff enough to bear an adult’s weight.) A detailed online search and six store visits later, we finally snagged the last correctly sized set available in all of Oslo. Thus commenced the sales clerk’s dissertation on the highly scientific process of attaching the bindings, which appeared to involve a complex set of algorithms involving height, weight, the type of boot, and far too many other variables for me to comprehend. When combined with the chemical formulas for applying the correct base layers of waxes, the entire procedure seemed best left to the experts, so we elected to fork over the extra $150 for professional ski preparation. 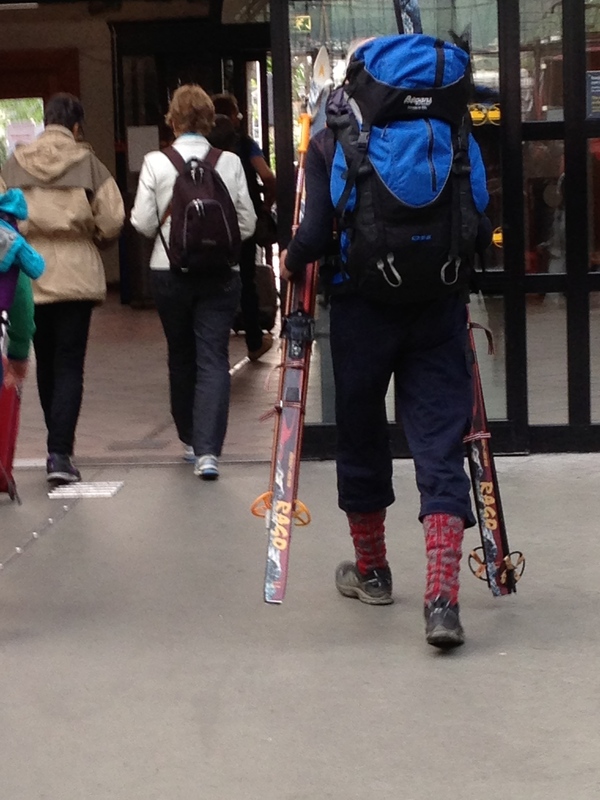 The more traditional Norwegian ski attire includes woolen knickers and knitted knee socks. 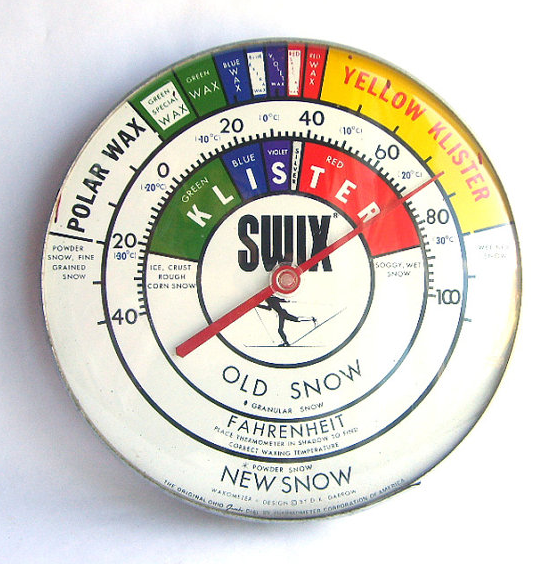 This handy-dandy ski thermometer makes waxing looks oh-so-simple, doesn’t it? Umm. Yeah. Waxing proved not as easy as it sounded. On our initial foray around the lake at Sognsvann, we spent about an hour attempting to surmount our first hill. We must’ve looked like a Fred Flintstone cartoon, running in place without ever actually going anywhere. No amount of layering or burnishing the recommended blue wax onto our skis reduced their slipperiness or resulted in our ability to achieve forward motion. When a troupe of four-year-olds easily chugged past us up the hill, we decided to retreat to flatlands and headed to Vigeland’s Parken. Gliding over the level terrain proved easier, but when we attempted going downhill, our feet shot out from underneath us like bullets from a gun barrel. More waxing and burnishing, more bruising falls, and the resulting pounding headaches finally encouraged us to retire for a meal at the Vigeland Cafe. 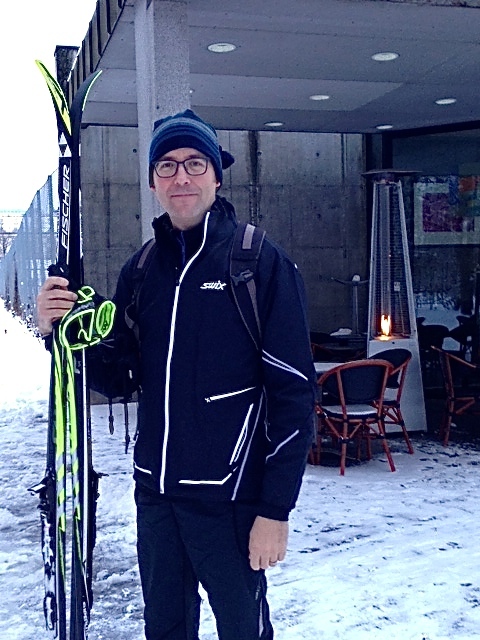 Matthew prepares to retreat to Vigeland’s Cafe for coffee and Advil to ease his ski headache. We decided to give it another try several nights later and headed back to Vigeland’s Parken for practice. 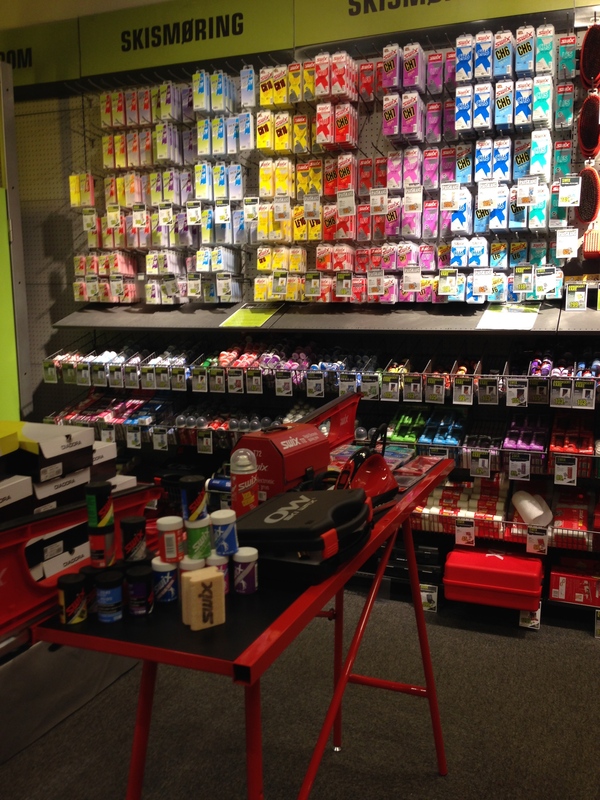 This time we’d brought along the red wax and dutifully applied it as prescribed to make our skis stickier. Bad move. Now it felt like someone had applied crazy glue to our feet. Oh how I longed for my waxless skis back home. After a half hour of grunting, digging, sweating, and flailing, only to move about 20 feet, I’d had enough. In frustration, I calmly unfastened my bindings, took off my wrist straps, and hurled skis and poles as far away from me as I could manage. Oh yeah. Waxing is easy. Just pick from the plethora of skismøring (“ski butter” along the wall), then put your skis on the smørbord (“butter table” in foreground) and lube ’em up. As Matthew collected my forlorn equipment, the guy approached and said, “You got wrong wax. You need lesson.” No kidding? Matthew assured him that we’d heed his oh-so-helpful advice, and then ran to catch up with me as I waited for the Trikk. On board the train, we were besieged by normally reserved Norwegians who eyed our skis and excitedly peppered us with questions. “How was the snow?” “Good conditions?” “Which type of wax did you use?” Typical conversation-starters here in Oslo, but now just fuel on the fire of our burning ire and disappointment. We finally elected to get off the train and walk the rest of the way home just to avoid more well-meaning waxing advice, and the ensuing bus-crowd debates that followed. As the saying goes: “Ask six Norwegians about the best way to wax skis, and you’ll get seven different answers.” Oh well, tomorrow is another snowy day. And apparently attending skiskole is in our near future. “It’s okay. You okay. Do well. Don’t be quitter.” Love it! Wow, such a complicated process! Who knew all of these interesting cultural and weather related quirks!